The successor of Rends A10 Cyclone by RENDS, here we come A10 Cyclone SA under a new brand called Vorze. VORZE A10 Cyclone SA is not just a simple upgrade, it has an enormous evolution! Now with a sleek body design, is rechargeable and with an easy accessible controller, it brings the user all sort of pleasure and convenience. Also it is stronger, quieter, and neater and has an interactive app to play with. The A10 Cyclone SA not only can be enjoyed on its own like R-1 A10 cyclone set. But also can be programmed with your own patterns and even use these with your own videos and it works really with every available video! 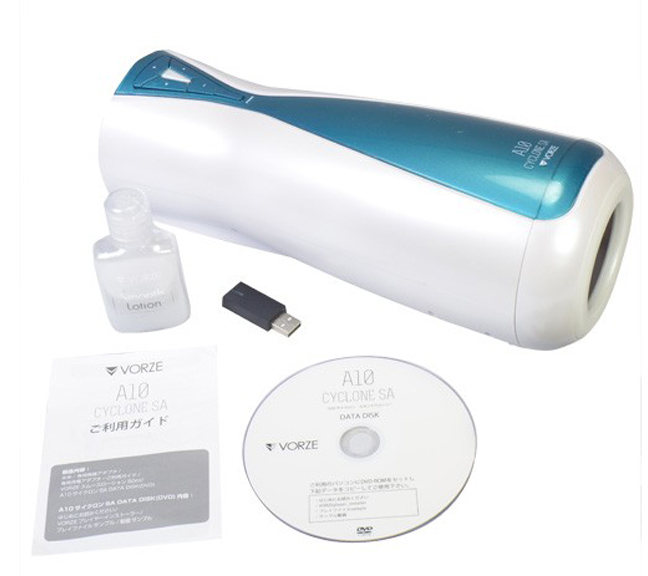 The VORZE A10 Cyclone SA comes with a bluetooth dongle that connects the unit to your PC. The official VORZE Player makes it possible to play any video combined with a mode script. Mode scripts are simple Excel sheet that contain timers for each rotation mode. It is possible to program the direction, its speed and of course the timing: this way there are endless combinations of patterns! Share the script of your favorite video with your friend and maybe somebody already has a script for your favorite video? The VORZE A10 Cyclone SA is rechargeable now. Recharging the built in lithium battery takes 2 hours from empty to full. Fully charged the VORZE Cyclone SA may be used for approximately 2 hours. The VORZE A10 Cyclone SA is even easier to mount and clean. The cover is magnetic. Just remove it by pulling it off. The inner cup holder is magnetic as well. It is just as easy to remove as the cover. To remove the inner sleeve from the sleeve holder just push the little clip at the rear end of the sleeve holder. Now you can just take off its cover and remove the sleeve to clean. To mount it just proceed the other way around. Please be carefully when inserting the sleeve into the cup holder and make sure that all 6 pins go through the sleeve’s mounting holes. All inner sleeve for the VORZE A10 Cyclone will be delivered in a classy designer package, of course hygienically sealed. Rends has officially stated that the VORZE A10 inner sleeve are re-useable. Master: The Master inner sleeve features 8 small fins. Infinity: The Infinity inner sleeve features an organic-style inner structure. Vortex: The Vortex inner sleeve features a cylindrical curved chamber. W-Flap: The W-Flap inner sleeve features 2 big fins. Spiral: The Spiral inner sleeve features spiral-shaped fins. Crystal: The Crystal inner sleeve features various pyramid-shaped nubs. The main unit is not water-proof. Only washable parts are the magnetic cover, the cup holder and of course the inner sleeve. This is for unit only. The inner sleeve is not included and must be purchased separately. The unit will only work on PC (Requires Windows 7, 8, or 8.1). Buil in lithium ion battery which accepts 100-240V charging.